At the prompting of former President of Liberia, Ellen Johnson-Sirleaf, frontline presidential candidates in the Saturday election, President Muhammadu Buhari and former Vice President Atiku Abubakar yesterday shook hands. 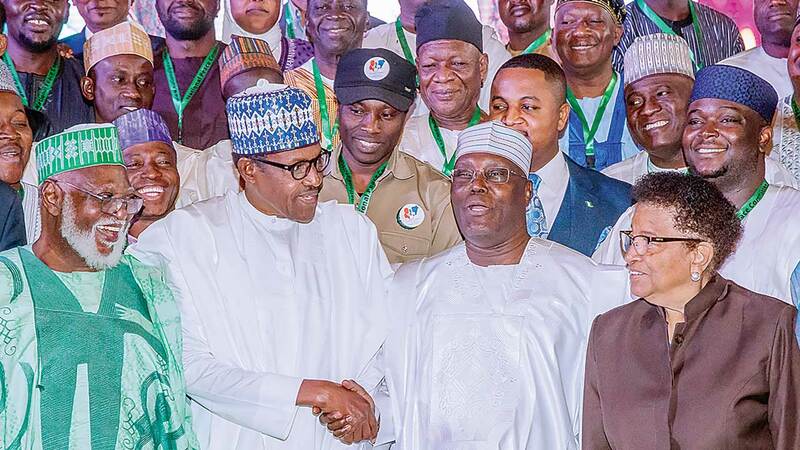 This took place amid cheers by other election observers who attended the final signing of the peace accord by the duo and 70 other contenders in Abuja. Johnson-Sirleaf is leading the ECOWAS observer mission to Nigeria. The event, held at the International Conference Centre, Abuja, was also attended by other foreign and local monitors. The first accord was signed on December 11, 2018. Buhari is the candidate of the ruling All Progressives Congress (APC) while Atiku is of the main opposition Peoples Democratic Party (PDP) in the election scheduled by the Independent National Electoral Commission (INEC). Buhari, in his address after the signing ceremony, urged fellow contestants to commit to the final outcome of the polls. The president, who noted the anxiety in the air, especially coming after one of the most peaceful elections in the history of the country, in which he emerged the winner, expressed optimism that the players are mature in their disposition towards electoral outcomes. “Another election is upon us, and not unexpectedly, there is anxiety in the air. This is typical of any form of competition and contest, no matter how well prepared all contestants and regulators are. The forthcoming elections are very special and significant for the growth of our democracy. He said the electoral umpire had received all the resources it needed to perform its assignment. In his speech, Atiku appealed to every official and the leadership of INEC and the Nigeria Police to be fair arbiters while letting neutrality prevail. “For emphasis and in the spirit of fair play, I also urge our security agencies, not to embark on indiscriminate arrests of members of the opposition, 24 to 48 hours before elections, as had been the case in previous elections. “Consequently, I also appeal to President Buhari to use his good offices to ensure that every eligible person who casts vote is confident in the process and in the belief that the vote will count. “Despite concerns expressed by my party leaders concerning likely electoral malpractices and the intimidation of voters and observers, I trust that our election officials and security services will do their duty in accordance with their oath and obligations,” Atiku said. The Chairman of the National Peace Committee and former Head of State, Gen. Abdulsalami Abubakar, said the panel organised the event to ensure a peaceful conduct of all elections in the country. According to him, elections will not hold in the absence of peaceful atmosphere, even governance after election will not be peaceful without a peaceful environment. “Don’t make anything to make a bad situation worse,” he said, noting that disharmony among political parties retards Nigeria’s development. Abdulsalami alleged spreading of misinformation in the nation’s mosques and churches. “This must be contained,” he said. Another former head of state, Gen Yakubu Gowon, urged the candidates to prevail on their supporters to conduct themselves with decorum during the elections so that in the future, there may be no need for foreign observers because the right disposition would have been assured. The Secretary General of the Commonwealth, Patricia Scotland, said millions of people across the world were praying for Nigeria and its people hoping that the elections would hold peacefully. She noted that the Saturday’s elections would be the sixth since 1999 when the country returned to democracy after military rule. She said all concerned should not fail by ensuring a credible and transparent election. The Convener of the Nigeria Civil Society Situation Room, Clement Nwankwo, said it should be an opportunity for the country to get it right. He also urged security agencies to be neutral, noting that elections are not the responsibility of state institutions like the army, police and other security agencies. Others in attendance included a former President of Tanzania, Jakaya Kikwete, who heads the Commonwealth observer mission; Festus Moghai, a former president of Botswana who is heading the Democratic National Institute and Republic National Institute, chairman of INEC, Mahmood Yakubu; and Catholic Bishop of Sokoto, Mathew Kukah.